I just completed Lego Battles for Nintendo DS, and I feel like there’s a void in my life now that I’m no longer pecking away at it. It was my nightly routine: I would put on my pajamas, wash my face, make sure all of the furry critters in the house were fed, and then crawl into bed with my DS and a glass of water and play a level or two of Lego Battles. I had a ton of fun playing it, and I never would have guessed that I would enjoy an RTS. But I did, and now I miss it. I don’t really have anything else I want to play on my DS. Releases have been kind of “meh” the past few months. How depressing. I love the Lego games, though. They’re always really fun, and not too easy. I’ve played through Lego Star Wars, Lego Indiana Jones and Lego Batman on the Xbox 360, and I know I’ll end up getting Lego Harry Potter when it’s released, even though I’m not technically a “fan” of Harry Potter. I have Lego Rock Band, which is way more awesome than I thought it would be. I mean, I love Rock Band and I love the Lego games, but I didn’t think it would be that good. Turns out, it’s awesome. 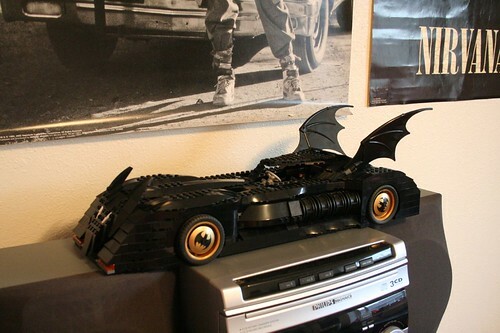 I received the best Christmas present a couple of years ago: a Lego Batmobile kit. I squealed. It’s so amazing. I actually have a Batman action figure sitting in the driver’s seat. Did I mention there are flames that shoot out of the back of the car, and they spin when the wheels roll? HOW AWESOME IS THAT?! The album artwork I’m doing for Say Like The French Say is all Legos. David and I sat and built all of the scenes from my Legos, and then I took photos of them. They’re pretty fantastic. You’d think that turning 30 in a couple of months would snap me out of my child-like ways, but I don’t see that happening any time soon. I still go down the Lego aisle at Target to see what’s available (I’m kind of tempted to get a Prince of Persia kit just so I can have a little Jake Gyllenhaal minifig). I go on eBay to buy Lego pieces I can’t find anywhere else. My excuse is that as a kid, I didn’t have a lot of money to spend on toys, so I’m making up for it now. At least, that’s the story I’m going to go with.